As we step out of our cars in the front circle of Aiken High School, a young woman on the opposite side is belting out the national anthem. Her peers are astonishingly quiet. 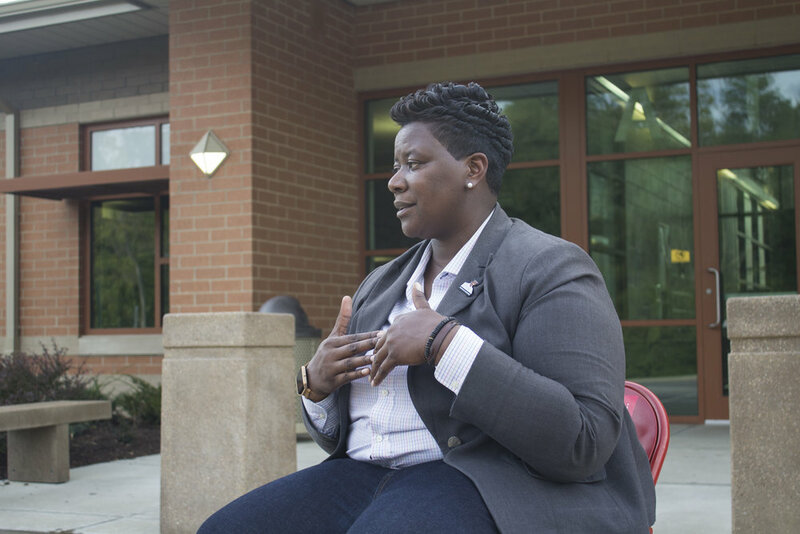 We pause, and across the way, Tamaya Dennard, candidate for city council and innovation specialist at Design Impact, does the same, leaning against her car to listen. The anthem draws to a close and, just as we’re about to clap, the girl’s friends break up the silence, laughing and yelling along with her, “the home of the brave.” “Aw, guys!” she yells. We meet Tamaya – red folding chair in tow – and her communications director, Tara Keesling, at the front of the school. “Man, she was killing it,” she says. Tell us about yourself in a nutshell. I’m from Cincinnati, originally, born and raised in College Hill and graduated from Aiken High School 20 years ago. I was raised by my mom and my grandmother, and my mom was a single parent. I grew up experiencing poverty of different levels. My mom is a returning citizen, meaning she has a criminal background – in and out of jail about three times – so thank goodness I had my grandmother. I grew up really struggling. One thing my mom was really good about, though, was getting me to think more about how things could be, not necessarily how things were. And it was that kind of push and motivation that led me to be the first person in my family to graduate from college – UC College of Business. I have 10 years of overall real estate experience. The last part of that career was at Duke Energy, working in the estate side, buying and selling right of way and doing a lot of real estate research. Then I jumped into politics in 2010. A friend of mine [P.G. Sittenfeld] was running for city council and he asked if I could help him out. I was like, “Yeah, I’ll stuff envelopes and knock on doors,” literally thinking that was going to be the extent of it. I always loved politics, but not necessarily as a career. So I was volunteering for him – loved it. He asked after we won if I could come to City Hall with him. And I said no. And then he showed me his salary and I definitely said no. At the time, he had a certain amount of money that he could offer, and then because of my delayed response, that pool of money started diminishing. At the point where he only had $14,000 left in his budget to offer me, I took it. So I took a pretty substantial pay cut. It was the craziest and the smartest thing I’ve ever done. We worked together for a lot of years, and then I left City Hall to become his political director on his Senate race. One thing I noticed on the Senate race was I was the only woman on the senior advisory team, and I was the only black person on the staff, period. And that was a little bit troubling to me, not because of anything he had done, but more so because a lot of black people, a lot of women vote democratically, and so I was wondering why we had not as many opportunities for women and minorities in politics. So I got on the circuit of Elect Her and different organizations that encourage more women to run for office, including a TedX Talk, and then just decided to take my own advice and run for office, so here I am now. You chose Aiken High School for our meeting spot today. Why are the community and school here so meaningful to you? A lot of people have pride in their high school, but when I tell people that I graduated from Aiken High School, they’re always a little bit shocked. In Cincinnati, the high school question…it’s the way we try to put people in certain categories and use it as a class statement. So when I say I graduated from Aiken High School, which is a predominantly African-American school – what they would categorize as an inner city school – it always surprises people that I have a lot of pride for the high school that I went to. College Hill means a lot to me because I spent the most formative years here, being trained and loved and nurtured. I’ve had amazing teachers and mentors that I would not have met had it not been for Aiken High School. So this place will always hold a special place in my heart. In your TedX Talk, there’s a moment where a guy comes into your office at City Hall and suggests moving the bus stop in his neighborhood three blocks away from the store to keep the “riff-raff” out. Your response: “Have you ever caught the bus with groceries? Have you ever caught the bus with groceries with kids? Have you ever caught the bus with groceries with kids in the rain?” Did that response come from personal experience? When I was growing up, for a lot of the years we didn’t have a car, so luckily there was a Kroger in our community on the corner of Hamilton and North Bend, which was about half a mile from our house. So we walked to the store a lot, and I couldn’t imagine some days if we had an extra three blocks tacked on. That was particularly poignant; for one, that moment solidified why I should be in politics, because I had to be a voice for people who weren’t in the room. Not that the person meant any malintent. But it’s also more indicative of how women govern. We’re a little bit more empathic and we think a little bit different. Three blocks makes a difference for people. So that moment meant a lot to me and it definitely made me – in the midst of making $14,000 and struggling – affirmed that I’d made the right decision to be there, and I think a lot of times that’s what happens in politics: People don’t think about everybody every single time. And that’s part of the reason why I decided to run for city council. I think it’s interesting, what you said: “He didn’t have any malicious intent.” I think that’s something that often stops us from having conversations…someone says something a little ignorant, and the other person might just write them off rather than take the time to explain: “Hey, actually those three blocks mean a lot to a lot of people.” There’s resentment instead of collaboration. Thoughts? I always look for opportunities to educate and I want to make sure that we foster understanding. I think that’s the only way we get beyond a lot of the trouble that we have in our country. We’re actually more alike than we are unalike, but there are so many things that get in the way. And so, in our swiftness and quickness to be justice-minded, we also have to be tolerant and welcoming, and that’s where you’re going to get somewhere. Tell us more about that transition as you realized you didn’t just want to be behind the scenes in politics. I started speaking in 2011 for Elect Her, which is an organization out of DC that encourages college-aged women to run for office, and so I was teasing some of the back end stuff – where the sausage is made: how to communicate with voters, what that looks like, what are the principles of running for office? Building relationships and strategy and things like that. So it didn’t occur to me until then that I could possibly be a candidate. I just wanted to be involved in politics. But again, as I started looking around and understanding politics and how many women were actually voting, how many black women were voting, but then looking at who was representing, there weren’t people that looked like us. There was at one point a picture of Congress that someone had taken, and they were all old white men. And some of my favorite people are old white men, but you know, that’s not representative. And that’s why you have a lot of deep disparities in policy, and that’s why you have such inequality in wealth. It explains a lot, because people who are impacted should be able to see themselves in government, and that wasn’t happening and still is not happening in this country, and that’s part of the reason why I decided to run for office. You mentioned that Elect Her focuses on college-aged women. And you once wrote in the Enquirer that we need to tell young people that they matter. Why is the young generation so important to you? I mean, we talk about a representative government. Age is a part of that. You think about the government right now: There’s no millennial serving in the United States Senate, but it’s the largest generation in the history of this country. There’s something wrong with that. So, no matter what your age is, no matter where you grew up, no matter what your income is, no matter what your gender identity is, no matter what your sexual orientation is, you should have government that looks like you. I’m very passionate about the young people specifically because they have a voice, and it’s not going to be the same as ours. They may express their views differently, but they’re very passionate. You go to any Black Lives Matter rally or you go to a rally around social justice – they’re mostly young people. But for some reason, we stop short of actually encouraging young people to run for office and to think about policymaking. Even though I’m not, you know, the youngest person ever, and I have plenty of gray hair, my goal is to help young people see themselves in office, as well. We’re trying to judge younger people by different standards, and they want to define themselves. And they should be able to define themselves. It’s very, very important that young people get involved so that they can shape government to be what it can be and should it be for everybody. Government has to serve everybody, but everybody has to be able to see themselves in government. Tell us about the idea of the folding chair. There’s one woman, and she’s a little bit before my time, but I studied her a lot: Shirley Chisholm. Shirley Chisholm ran for president in 1972, and she was actually the first woman from a major party to run for president. 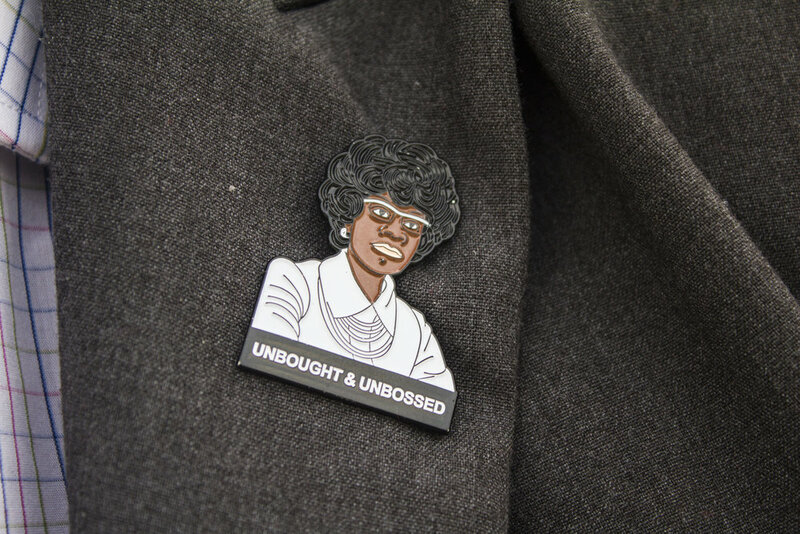 A lot of people think it’s Hillary Clinton, but it’s actually Shirley Chisholm. And think about in 1972 the sexism and racism that she faced as she ran for president, and she actually received some delegates. There’s something very endearing about a folding chair. It’s not as permanent as one of those big chairs, you know, with the wheels on them, meaning your chair may not look like everybody else’s, but bring what you have. If they’re not willing to make room for you, bring your folding chair, ʼcause a folding chair is narrow. It folds up and it fits anywhere, so that quote means a lot to me as we engage people who have historically been marginalized by our political system. So if it’s women, if it’s poor people, if it’s nonwhite people, if it’s black people, Latino people. You need to feel empowered enough to make your voice heard. And so our campaign is all about bringing your folding chair to the table. We’re trying to represent a certain sect, but we also want them to feel empowered that once they see somebody who looks likes them, maybe they’ll be encouraged to bring a folding chair, as well. Do you have any stories of a time you’ve seen that impact somebody? We hear it a lot, which I’m very excited about. We’ve had about 400 individual contributions to our campaign, but over 300 of those have been people who’ve never given to a political candidate, ever. I have a particular story where a high school student came up to me on the street in Walnut Hills and gave me $10 and was like, “This is what I have.” A student…like, she didn’t have to. If she’d have just said, “I follow your campaign” – that’s awesome. She’s not even old enough to vote, but the fact she gave me $10 meant a lot to me on our campaign. You’ve said before that women feel this additional pressure to be “perfect,” and often that keeps them from getting into politics. It keeps women from a lot of places where we should be. A woman’ll look at a job description, have 80 percent of the qualifications, feel she’s not qualified. A man will have 20 percent of the qualifications; he’ll think he’s perfect for it. We’ve been socialized our whole lives as women to be perfect. We were raised when we were younger: “Don’t open your legs when you have a skirt on,” instead of telling men, “Don’t look up women’s dresses.” Or, “When you go out, watch your drink” instead of telling men, “Don’t put things in people’s drinks.” We’re made to feel like there’s something wrong with us and we’re not doing things right. And so that socialization of perfection, it kind of presents itself particularly in politics where you’re under scrutiny. We’re already under scrutiny anyway. I remember in the last election, someone asked Hillary what she was wearing; she was on the red carpet and she was going to a press conference. I’ve never heard anybody ask Barack Obama what he was wearing. And you know, we still do it. Even though I’m not really a fan of Melania Trump or Kellyanne Conway, I’m very slow to criticize them for how they look, because that’s what we always do to each other. It’s very hard to run for office, and women, we don’t run a lot because we’re not asked to run a lot, whereas men think it’s their duty and they jump right in. But women, we have to be asked. No one asked me to run for office. I took it upon myself. We also run for office later in life, on average. Think about Maxine Waters – she was a volunteer community organizer and a volunteer for Head Start for a long time before she ran for office. You think about EMILY’s List – the acronym is Early Money Is Like Yeast. You need people to invest in women candidates early, and they won’t do it. You need money to attract money. And for some reason, women don’t get people to invest in our campaigns early, so it’s incumbent upon all of us to encourage each other until the rest of the world catches up. Madeline Albright was famous for saying there’s plenty of room for mediocre men in the world, but there’s no room for mediocre women. That is real. That is absolutely real. It drives me crazy. With my qualifications – I’m not trying to be braggadocios, but I’ve run other campaigns, and I feel like if my name was Thomas Denard instead of Tamaya, and based on my resume and my resume alone, perhaps we’d be a lot further in terms of our exposure and media coverage. I’m not really a talked-about candidate because I haven’t done anything, like, ridiculous. An inability to marginalize me makes me not a talk-worthy candidate. I’ve been running, I think, a pretty stellar campaign. One of the best ones I’ve seen – but not by my doing. It’s ʼcause of people like Tara and Kevin and Andy and Anthony and Dominique. But, there’s no room for mediocre women. Take Hillary Clinton, for instance: the sexism that she faced. I’ve never heard anybody be talked about for being overprepared. Misogyny that was masked, basically. But that’s women. The things that make us feel like we shouldn’t be candidates are the very reasons why we should run for office: Not being perfect. Understanding struggle. Wanting to understand people in different ways. And we think that those are handicaps. But having kids, juggling different responsibilities, understanding what real people go through are the very reasons why women should run for office. You touched a few minutes ago on the major driving force behind our political system: money. I wish that money weren’t a factor in politics. I talk a lot about the process of running for office. You get people in office who are so privileged that they don’t generally understand the challenges or the people that they’re trying to solve for. They didn’t really experience poverty; they didn’t really experience inequity in transportation; they didn’t experience what it’s like to be displaced out of their communities. So that’s part of the reason why we get mediocre people who run for office: Sometimes it’s a matter of who can raise the most money, who can get their name out there the most, not necessarily who is the best person for policy or who has the best ideas. If it were just purely on ideas, and not how much money you can raise, I think we would have a lot more effective government. It goes back to what you were saying earlier about that need to put people into categories. We feel this need to “other” people. That’s another thing about politics: We’re just in this society of “other.” And that’s the difficulty for me, a lot, because even though I grew up underserved, on public assistance, and things like that, my mom – she in her wisdom – she wouldn’t let us have what we call a lazy tongue. So I couldn’t say faaan; I had to say fine. So a lot of times people are like, “Well, you’re not from the hood.” I have a corporate background, but I grew up poor. They’re like, “What do we do with this person?” And I think that’s the scrutiny, that you kind of put yourself out there. I get hate mail in my inbox – crazy stuff. But it’s worth it, because the goal for us is to change systems and move them from these middle class and social norms that they’re based on, because those are the norms of the policymakers. So the goal is to get more people with different experiences involved, so that we can shift the way policy looks. Like having council meetings at 6 p.m. instead of 2 p.m. because people work. Having transportation systems that work for people who are 3 a.m. to 11 a.m. instead of people who are 8 to 5. These systems have to change, but they’re only gonna change when people who have different experiences get involved in government. It is my belief that people who are most impacted by an issue are the ones that are going to help you design your way out of it. Speaking of design, tell us about Design Impact. No disrespect to anybody listening, but I have the best job ever. I really love what I get to do every day. We use design, but we use it on social justice issues. So the same process that you would use to design a phone or a chair or anything else. You think about your Starbucks experience, which is very designed – the whole thing of writing your name on a cup to where you stand, where things are placed. Then you think about your experience at like, the BMV, which is an undesigned system. We still stand in line for a service, and you need it, but you can tell one was more thought out than the other. So at Design Impact, we don’t design things; we help organizations/nonprofits design systems or processes or programs. So half of our team are designers – product designers, graphic designers, industrial designers; the other half are practitioners of economic development, community development, education, social justice, and research. We just started working with CPS. They’ll hire us to create this outcome, so we help them do it with two principles: inclusivity and creativity, because all voices matter, and they have to be a part of the process. So we don’t care if you’re a student or a teacher or a principal. If you either impact or you’re impacted by something, your voice needs to be heard. We also help a lot of organizations that are so into the muck of things, they need permission to be creative. We give organizations tools to help inspire creativity in order to do that. So it’s a very fun job. Every day is different. The fun part is when people, their eyes are opening and they’re having the aha’s. They’ve been doing the same job for 20 years, but by virtue of us giving them these tools, it’s helping them to see their process in a new light. Has to be my mom. She’ll be 64 in October, not in the greatest of health, but she stands on her feet for 10 hours a day, every day. And she is my hero for a lot of reasons. Growing up and going in and out of jail, you understand that jail is a place for bad people, but my mom, she did what she had to do to make sure that I had what I needed. My mom is pretty amazing; she’s really sweet and polite. Everybody loves my mom. She’s been really supportive of the campaign. She works second shift, so she can’t come to things, but when I was in high school, I played basketball and the same shift she works now, she worked then, and she couldn’t come see me play a lot. But she makes up for it; she’s taken off work to come to things on the campaign, and that’s really cool ʼcause she’s like, “Now I’m able to do this.” She was so afraid of losing her job – she knew she had a criminal background; she knew she wasn’t very employable, so she couldn’t take those days off. But now she’s been there for 27 years; she has leeway, so she gets to take off and come support me politically. She actually moved so she can vote for me. Raised her rent just $50, just so she could move into city limits so she can vote for me. She don’t have the money to do stuff like that, but the fact that she did means a lot to me. My mom’s everything.